I've seen a few variants of this on muffwiggler, none of them did quite what I wanted so I've developed my own. My primary purpose was to sync my MFOS step sequencer to the BPM of midi based drum sequences. After an initial trial it became clear that the ability to divide or multiply the BPM clock rate would also be useful and the ability to sync the start of the clock output running to any midi note on message. Finally I added a second clock output because I could. A simple 16 character 2 line LCD interface allows easy set-up and control and also displays the incoming BPM rate. Navigation is via three buttons that allow you to move between parameters and cycle through a small list of preset values. Not shown is a second Page that allows you to select the Midi Channel on which the initial Midi Note On sync is received. Once running the clock output will generate analogue clock pulses (approx. 7.5V) in time with the chosen multiplier/divider and incoming BPM rate, the unit tracks changes in the BPM in real time. I've mounted this as part of a 1U 19" wide utility panel at the bottom of a small rack containing my MFOS sequencer and Voltage Quantizer. A few pictures taken during construction. The green PCB is the MFOS voltage quantizer, there is also a small Veroboard visible that provides an op amp output buffer and panel wiring interface for it. The module is PIC chip based, outputs are buffered through an Op Amp and midi thru is also available. 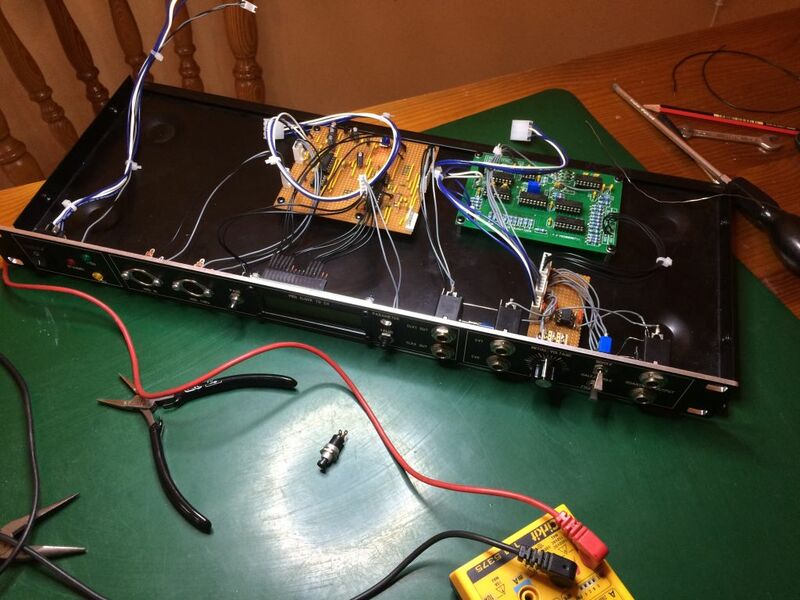 I've used an Oakley power supply (+/- 15V) because the majority of my equipment is Oakley, it should work fine with a +/- 12V supply however a minor modification would be needed to combine the Panel ground and 0V rails which are separated out in an Oakley system. If anyone is interested I am happy to post the schematic, Veroboard layout and source code for the PIC chip, you will need your own PIC chip programming device, I use a MicroChip PICKit 3. 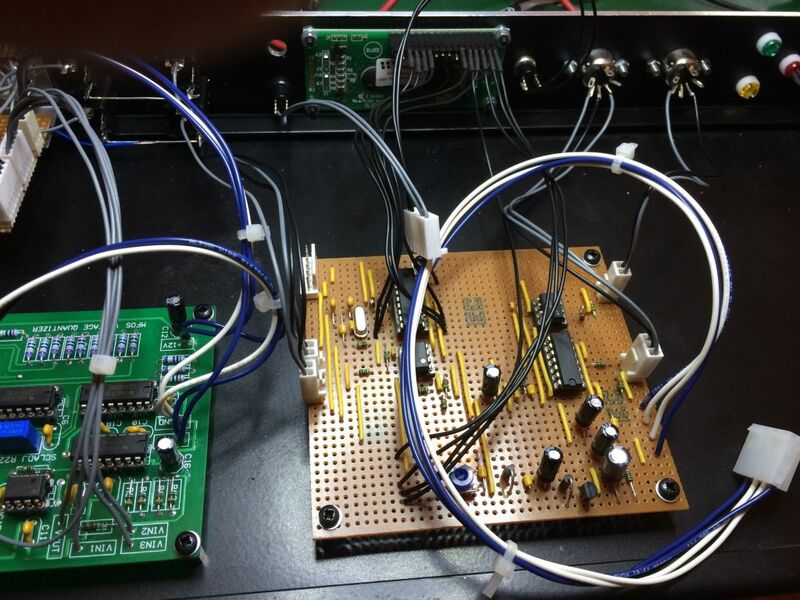 Your midi-to-clock converter is an excellent project. Great job. But i am also intetsted in the sequencer. Did you make an FPD-File or did you do it yourself? Schlumpfhut thank-you for the interest, there is indeed an FPD file for the MFOS sequencer, it is the Vari-Clock version and is attached. The panel is mounted on two 5U rack rails, which in hindsight may be overkill but does provide a high-degree of panel rigidity. I've mounted my pots on thin strips of veroboard to stop them twisting and aid with wiring, the pot hole spacing on the panel is aligned to standard veroboard hole spacing (2.54mm) to allow this. The panel is 10U wide. I've used two 12 position rotary switches for the Step and Mode controls, the holes for these on the panel are correct for the following Farnell part number : 1190375 and ensure the switches are locked into place. If you use these you will also require a couple of shaft hole size adaptors such as part number 782-1277 from RSOnline to enable you to fit a standard 1/4" knob. I've used 19mm diameter knobs throughout and text/hole spacing is aligned to this. 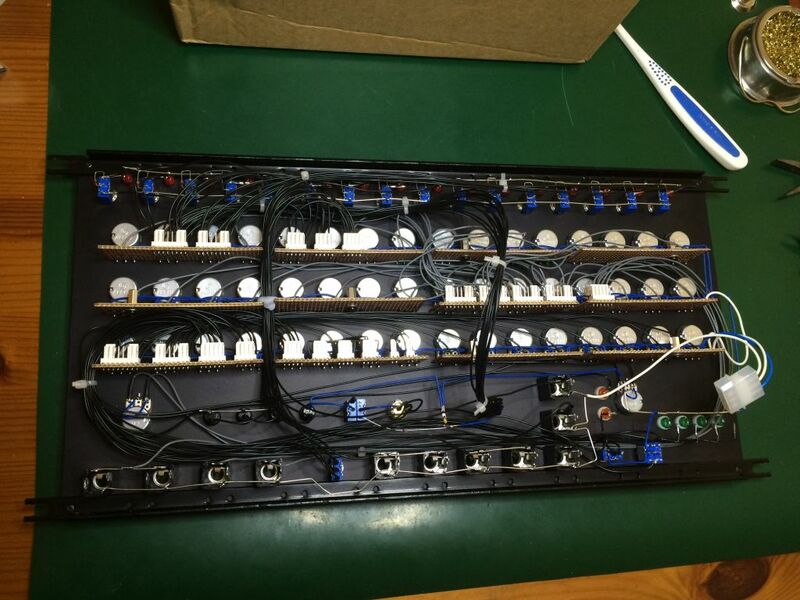 Below is a photo of the rear of the panel with all panel components attached and wired up on the veroboard strips. These additionally have allowed me to fit Molex headers as connectors to the MFOS PCBs rather than hard wiring them. I've also put 10mm M3 spacers on the veroboard (if you look carefully you can see a pair on each row) and the MFOS PCBs are attached to these. Not the most robust of solutions but it works fine if it's only sitting in a rack at home. Good luck if you are building one, the off-board wiring takes an age but I took my time and had no problems. I'm glad I made the decision not to hardwire the PCBs to the front panel as I have had to make a couple of mods since I built it to interface it to my Oakley system. 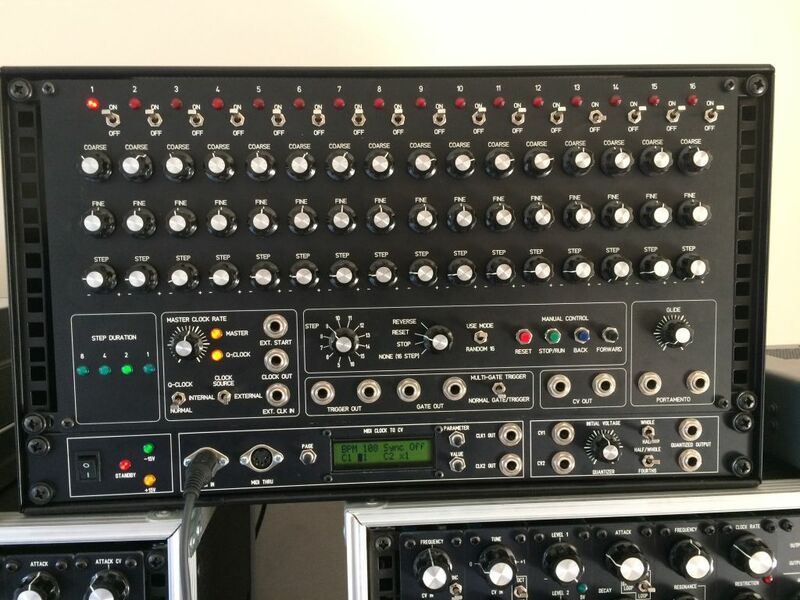 What features does your MIDI to clock device have that others you looked at don't, in particular the Moon Modular 553? Thank-you JLR for your supportive comments. In answer to your question : when I first looked a couple of years ago I didn't find what I assume is one of your modules? My apologies if I've trodden on toes it was unintentional, however no-one has asked for me to upload my implementation details yet so no harm done. I'll be honest, now I've had a look, the 553 is better suited to fitting on a 5U panel, mine is somewhat limited to a horizontal panel by virtue of the LCD display. In terms of functionality I think the two are very similar ('great minds think alike' or 'necessity is the mother of all invention'? ), the functions look almost identical if implemented slightly differently. I really enjoyed developing a module from scratch, the version here is a second iteration. I've learnt a very small amount of electronics and a small amount about PIC chip programming, all of which has added to the fun of what has become a great hobby. I've found muffwiggler to be such a great source of information that I thought it only fair to give something back - hence my offer to share the schematic, veroboard layout and code for those interested in building their own or modifying it. I hope that meets with your approval. I'm currently thinking of developing my own version of a 2 or 4-note polyphonic midi to CV converter (PIC chip based if poss), it may be well outside my capabilities but I like a challenge. I was also thinking about developing a Shepherd Tone generator module as my attempts to date to create said patch just using my Oakley modular have been unsuccessful. If these are already available let me know, I've tried tracking down the PolyDAC in the UK and have been unsuccessful so far. haha, well, no worries since I'm not an employee of Moon Modular! I do own lot's of their modules, have done many video demos for them, have worked trade shows with them (NAMM) and have even contributed a few conceptual designs for modules they ended up producing, but I'm just a humble modular synth consumer like everyone else. You should definitely consider making commercial products of your ideas!